Spiny desert begins just beyond the row of trees along the Mananara River here in the Andohahela Reserve. 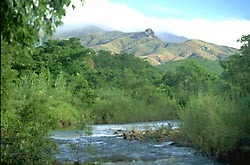 Rainforest lies just to the east, beneath not-so-distant clouds, an indication of the sharp transitions in climate that are characteristic of this region. This is one of the finest remaining stretches of riverside gallery forest in the spiny desert region, but its understory is severely degraded by overgrazing. © Copyright 1996-2001 David R. Parks and the Missouri Botanical Garden.